WASHINGTON -- Even if conciliatory rhetoric revives US-North Korea summit plans, President Donald Trump and Kim Jong Un must overcome a gaping disconnect over what a deal on the North’s nuclear weapons would look like. 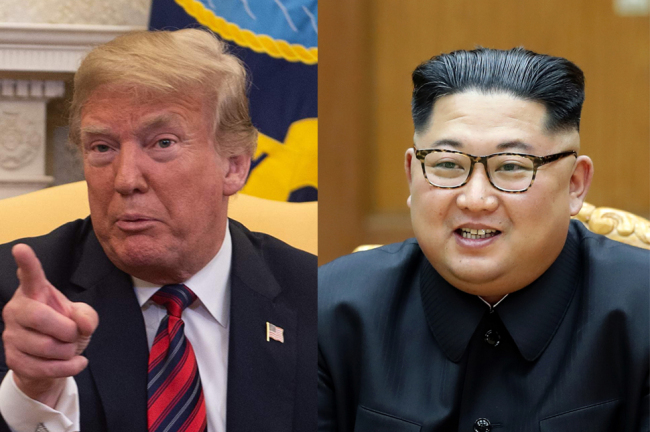 Observers of the soap opera-style Trump-Kim summit drama could be forgiven for thinking that a fragile courtship is underway, where the tenor of each side’s statements will determine whether the two can agree to sit down together. At the heart of the North’s negative rhetoric that led Trump to cancel the summit is a fundamental difference of views on the path to denuclearization. Reconciling those views may determine not just the success of any future meeting but whether a summit is feasible. Trump’s letter to Kim on Thursday blamed “tremendous anger and open hostility” by Pyongyang for derailing the June 12 meeting in Singapore. Then Trump changed his tune after North Korea’s vice foreign minister, Kim Kye Gwan, responded not with more threats but qualified praise of the president and openness for talks. Trump said Friday that the two sides were talking about putting the summit back on track, possibly on the originally planned date. And then on Saturday, Kim and South Korea’s president, Moon Jae-in, held a surprise meeting to discuss carrying out the peace commitments they reached in their first summit and Kim’s potential meeting with Trump, Moon’s office said. On Sunday, Moon planned to disclose the outcome of that meeting. It’s been a tempestuous few days that have left close US ally and summit-matchmaker South Korea “perplexed”; North Korea’s traditional ally China indignant that Trump was blaming it for changing Kim’s hardening attitude; and officials in Trump’s own administration struggling to stay up to speed with developments. North Korea’s fundamental position has not changed, even if its tone has. Kim Kye Gwan explained that the North’s branding of Vice President Mike Pence as a “political dummy” and its warning of a potential nuclear showdown were reactions to “unbridled remarks” by the US side pressing it to unilaterally scrap its atomic program. For North Korea watchers, it was a diplomatic blow-up waiting to happen since Trump impulsively agreed in March to meet with Kim and try to persuade him to abandon weapons that pose a growing threat to the continental US. “The massive gap between the United States and North Korea on denuclearization is the unspoken subtext to everything that’s just transpired,” said Evans Revere, a former senior State Department official for East Asia who since leaving the US government has periodically held informal talks with North Korean officials. That was a theme Kim Kye Gwan, a veteran North Korean nuclear negotiator, had expressed in starker terms a week ago when he lashed out at Trump’s national security adviser John Bolton for saying that the disarmament of Libya in 2004 was a model for a possible deal with North Korea. For the North, that was a deeply provocative comparison for two reasons. First, Libyan autocrat Moammar Gadhafi was killed following US-supported military action in his country seven years after giving up his nuclear program. Secondly, Libya had surrendered its fledgling program -- far less advanced than North Korea’s -- before receiving any benefits. North Korea is looking at a different type of deal. Frank Aum, a former senior Pentagon adviser on North Korea, said it seeks a phased process in which each side takes “progressive and synchronous” steps toward denuclearization and peace. The North has spent decades building a nuclear and missile capability to deter the US, and Aum remains skeptical that it’s truly interested in giving up those weapons although it sees value in going down that path to see what benefits it might get. For the Trump administration, a phased process would replicate past failed aid-for-disarmament deals with North Korea, although Trump himself this past week -- before he canceled the summit -- did not rule out an incremental approach that would provide incentives along the way to the North. He said Kim would get security guarantees if he denuclearizes. That suggests some flexibility on the part of Trump, who has vacillated between threats and flattery in his long-distance courtship of Kim and is clearly eager to have his shot at being the first US leader to meet with his North Korean counterpart and even bring peace to the divided Korean Peninsula. Revere said what’s needed now is what should have happened in the first place before Trump impulsively agreed to the summit: an effort by officials to try and bridge the vast gap between the two sides. It’s a gulf which does not appear to have narrowed despite two, rare trips to Pyongyang by Secretary of State Mike Pompeo to meet with Kim.